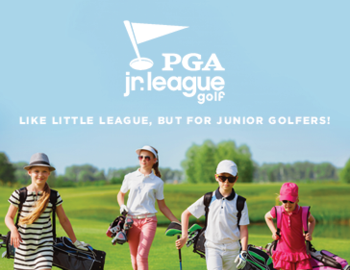 PGA Junior League Golf is a fun, social and inclusive opportunity for boys and girls, ages 13 & under, to enjoy the game of golf. Like other recreational youth sports, participants wear numbered jerseys and play on teams with friends. Players compete under the direction of a PGA Professional Captain in a popular two-person scramble format which reinforces the team concept and creates a nurturing environment for learning the game. When you register for the PGA Junior League at Falmouth CC you will receive 6 PGA Professionally instructed practice sessions, 5 to 6 matches, green fees, team jersey and bag tag. The charge is for everything is only $225! !